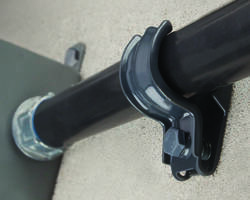 Two-Part Clamps support coarse- and fine-profile conduit. Concrete Slab Lift features space saving design. 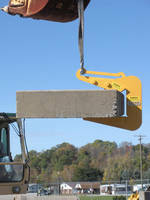 Designed for removing concrete slabs such as suspended bridge decks that must be lifted from one side, slab lift features slide balancing arm to allow operator to choose center of gravity for slab being lifted. 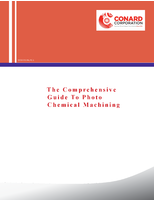 Lift is fabricated to meet custom specifications, as well as minimal space requirements. 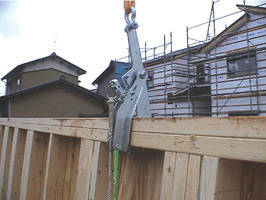 Universal Beam Clamps come in 1-10 metric rated tons. 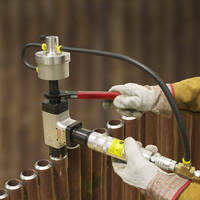 Adjustable Lifting Clamps handle cured concrete products. Available with adjustable lifting points for balanced lift, Model AMCS, non-marring adjustable lifting clamps have capacities of 551 or 1,100 lb. Two models of series come with multiple load ranges, and feature pivoting pads to align with load surface for proper contact. 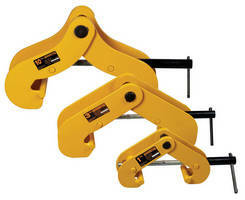 Lifting Clamp has rated capacity of 550 lb. Designed to lift and install housing panels, Model PFC-250 lifting clamp features polyurethane pad to protect external surface of panel. 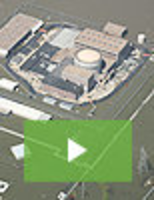 Locking mechanism protects from accidental load release and pull cord in unit allows lifter to be released from ground. Lower lifting plate has open design to clear nails or bolts. 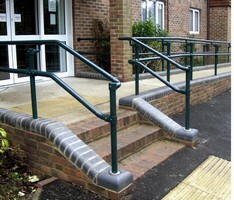 Railing System features structural, slip-on pipe fittings.